Metro workers in São Paulo suspended their strike after five days of an effective stoppage, which pushed management into making wage concessions. But the struggle for the reinstatement of 42 metro workers, sacked for their involvement in the strike, will lead to more action in the next days. 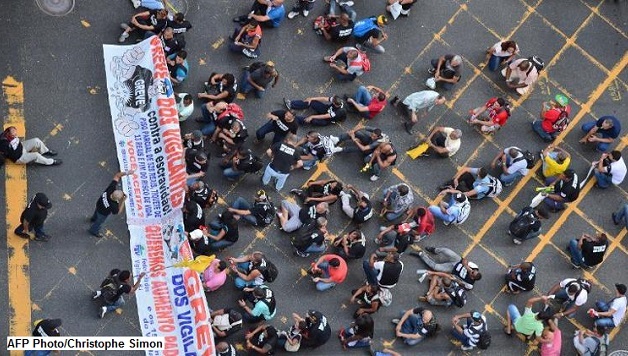 Meanwhile, other protests and strikes continue in Brazil, as the official start of the World Cup is accompanied by an exceptional deployment of state repression. In Rio de Janeiro’s three main airports, workers started a 24-hour strike last midnight. And tomorrow (Friday 13 June), at the initiative of the CWI, international protests will take place in solidarity with the struggles in Brazil; against the repression of social movements during the World Cup, in support with the “People’s Cup” (a land occupation organised by the MTST – a homeless workers’ movement) and for the reinstatement of the sacked São Paulo metro workers. Further news and analysis on these important developments will be published on socialistworld.net in the coming days and weeks.